Most people associate food from Italy with spaghetti or pizza, but there are many more foods that Italians prepare and eat. Sophie Braimbridge and Joanne Glynn, authors of "Food of Italy," report that Italians take food seriously. The Italian diet is considered quite healthy because of the inclusion of nutrient-rich vegetables and calcium-rich cheeses. Learning more about the foods eaten in Italy may inspire you to try new dishes native to the land. Nutritious vegetables are the basis of many popular Italian dishes, notes Fabio Parasecoli, author of "Food Culture in Italy." Minestrone soup is one famous Italian dish that includes many different types of vegetables, such as carrots, celery, cabbage and beans. Tomatoes are the base for many sauces used in Italian cooking, including marinara and bologonese. Potatoes are another important food used to prepare pastas and soups. Parasecoli suggests that vegetables are important in Italian cooking because they were easy and cheap to grow when Italy went through economic difficulties. Their health benefits have allowed them to remain a mainstay in Italian cuisine even in the present. 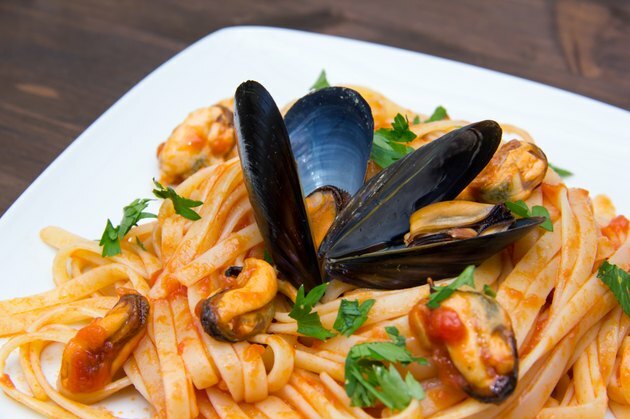 Pasta is the star of many popular Italian dishes. The traditional method for preparing pasta is to combine wheat flour with eggs and water to create a soft dough that is formed into a variety of different shapes, depending on the dish being prepared. Flat pasta is used to make fettucine or lasagna, and tube-shaped pastas, such as ziti, are used to make filled pastas. Small pasta shapes, such as orzo, are included in many soups native to Italy. Pasta is also used to make desserts. Flat squares of pasta dough are filled with sugar and spices and pressed together to make sweet versions of ravioli or canneloni. Italian cheeses, such as Parmigianno Reggiano and Parmesan, are important additions to many Italian foods. Many pastas are sprinkled with grated cheese right before serving. Creamy cheese, such as ricotta, is layered between noodles to make lasagna or is included in filled pastas such as ravioli. Pizza is another food common in Italy and includes shredded or sliced cheese. Cheese is also added to many Italian salads and soups. Sliced or cubed cheese is often served as an appetizer or as a side dish to complement sliced meat, bread and olives. Often cheese is served simply drizzled with olive oil and a small amount of salt and pepper.